Hungry Dragon is a fast-paced action game from Ubisoft entertainment. It lets you tame predatory fire-breathing monsters and control them to wreak havoc in a kingdom by devouring animals, birds, humans, goblins and several other unsuspecting preys. 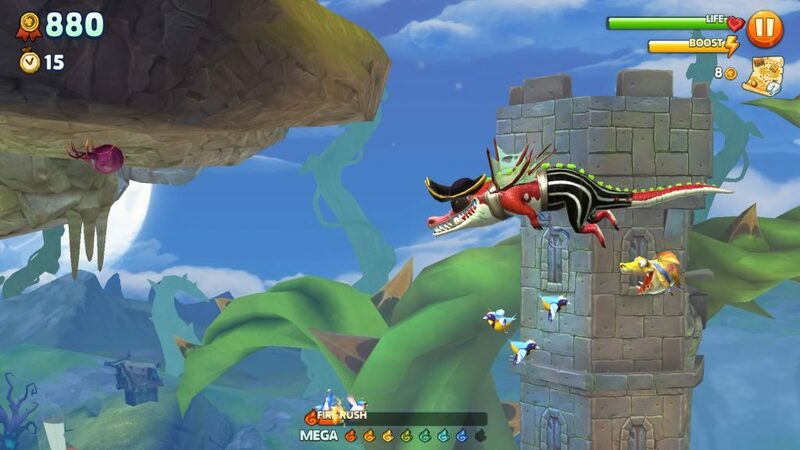 Each dragon has a unique trait and you can equip him with pets and costumes to help him explore, eat and destroy the kingdom effortlessly. The game boasts stunning 3D graphics. Controls are super smooth and simple. There’s a virtual D-pad on the lower-left corner of the screen and a boost button of the right side of the screen. Your goal is to eat to survive as long as you can to earn more gold and reach a high score. This beginner-level guide will help you avoid starving to death, explore the big kingdom to get bonus locations and score more points. The game has a simple control scheme. You can move your dragon using the virtual D-pad. On your right is the boost button, which can be used to boost his speed. There’s also a hidden control option called “tilt control” that enables motion control on your device. On turning it on, you won’t be using the virtual stick but controlling the creature by tilting the screen. When you enable tilt control, your dragon’s movement will be a lot faster and smoother. It will be easy for you to apply small turns, which couldn’t have been possible with the virtual d-pad. With a little bit of practice, you will be able to control his movement with much ease. This can be very helpful if you are controlling a large dragon. It will allow you to catch your prey faster and score more points. Make sure you turn this on when you are playing tournament mode as you would want to score more points to rank high up in the leaderboard to get rewards. To enable tilt control, tap options (gear icon) on the upper left corner of the screen. While playing, you can access options and calibrate tilt controls if you feel the dragon turns too fast. 2. When Should You Boost Your Dragon? Tap and hold the right side of the screen to “boost”. Boosting helps your dragon gain speed while flying. You should make the most out of boost only in certain conditions: When you are chasing a big target (this includes gold-colored prey, fleeing humans and goblins, flying creatures) or when you want to free your fire-breathing monster from an enemy attack. At times you will confront enemies that launch ranged attacks. You can tap and hold the boost button to move away from such an attack and then swoop down to eat them. You should also use boost to catch fast-moving targets, such as witches on broomsticks and certain bonuses such as flying pigs (you will get gems when you eat them). While boosting, keep an eye on the boost bar located just below the life bar. If you keep holding the boost button, the bar will decrease faster. Release and you will see the bar regaining some juice back. You can again use boost when the bar is full. The green bar on the upper-right corner of the screen shows how much life is still remaining. Make sure that the bar does not reduce to less than 50 percent. If it falls much lower than that, then your dragon will starve to death. Just make sure the life bar does not hit zero. Eat bigger preys such as vultures, humans, sheep, witches, smaller dragons etc. to give a quick boost to your life bar. Beware of poisoned body parts floating in the air. When you eat them, your life will be reduced drastically. Also, keep an eye on mines. Try to keep a large dragon away from a mine because if you are close to it and if you turn, his tail might hit it. When you see one, quickly move up or down to avoid it. Some spiders and plants will spew green colored poison. You will lose health if you are hit by it. There are lots of poisonous plants and animals in the cemetery. Make sure you equip a pet that reduces poison damage before venturing into this region. There are several kinds of unlockable creatures in this game. You can get a new creature when your current dragon reaches max level. The level bar on the top of the screen displays the current level of your creature. You can wait until a creature reaches max level or you can spend gems to buy a new dragon early on. Each dragon has a letter grade (S, M, L etc.). The targets a creature can devour depend of his grades. For example, Nibbler (Grade xS), can eat tiny goblins, humans, sheep, bats and a small-sized dragon, whereas Mad Snax (Grade S) can eat horses, owls, medium-sized green dragons and armed humans among other targets. A low-grade dragon can’t eat certain food. For example, an M grade dragon would easily devour a large spider, but a low-grade xS creature won’t be able to do so. A limited-time tournament will test your survival instincts against other players. The longer you survive gobbling victims and avoiding danger, the more points you will earn. Your position in the tournament leaderboard will be decided on your best run. The higher your score, the higher your position in the leaderboard and the bigger the reward. Remember that your highest score in a single run will be recorded and you will have to beat that score to record a new score on the leaderboard. The rewards you will be receiving will depend on your rank at the end of a tournament. So if you are ranked between 11 and 20, you will receive a purple egg. If you rank between 2 and 4, you will get an improved egg. If you rank 1, you will get an egg containing a rare pet. You will get a free try every 2 hours, but you can pay gems to partake on a run if you want to increase the chances of ending up higher in the player leaderboard. Your goal is simple: score as much as you can in a single run to get rewards. All participants will be given an identical costume and a pet to ensure they get equal chance to rank in the leaderboard. Hungry Dragon’s in-game map can be very useful to discover new and exciting locations. You get access to it in the beginning of the game once you collect the old, torned map icon while playing. When you begin playing, just tap the map icon on the upper right corner of the screen to know the current location of your creature. You can also enable “bonus locations” by upgrading your map. This will let you know the exact location of free eggs, letters H-U-N-G-R-Y and daily chests. You can upgrade your map once every four hours. Tap the mission button (checklist icon) and then tap “Free” to find locations of chests, letters and eggs. You will have to watch a 30-second advert to reveal more info on your map. 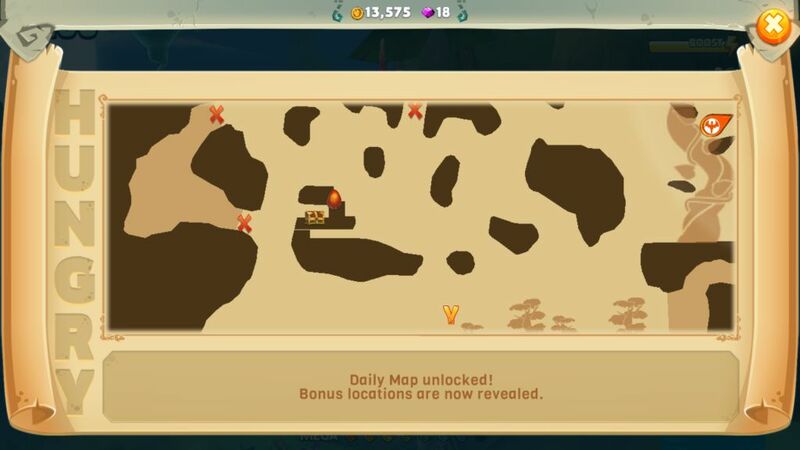 When you are playing, just tap the map icon and you will see it all bonus locations. The game lets you explore several areas, but the one that’s pretty untouched is “The Beyond”. This is probably the highest point in this game and to reach beyond the skies you will need little effort. Keep moving up until you reach the skies and then press and hold the boost button to go further up. You will find golden stars and rocky hoops. Collect stars and go through hoops to get gold. Each dragon can be equipped with a pet and costume. Pets and costumes power up your fire-breathing creature to help him get bonus food, coins, reduce poison effects and attack prey. A costume also bestows certain benefits that can help you survive or get bonuses during the run. You can get pets from eggs. 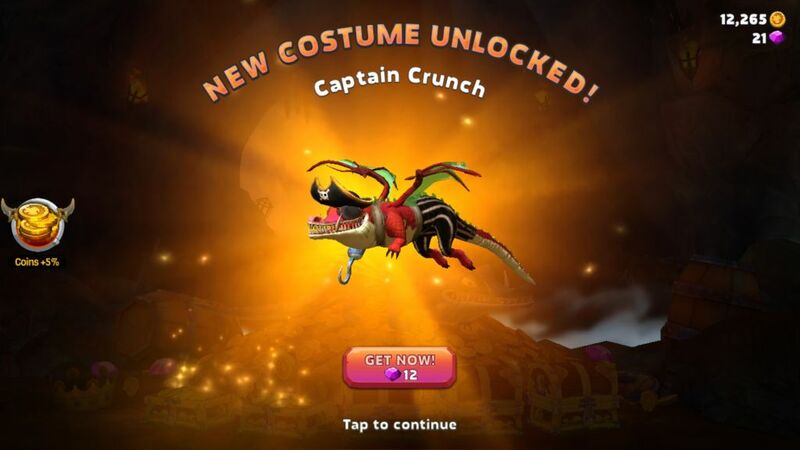 To get a costume, you will have to reach a certain level, which can be seen on the level bar above a dragon. Once you reach that level, you will unlock a new costume. You will have to pay gold or gems to get a costume permanently. Eggs contain pets, which posses super powers to help you during the run. Some provide a 10 percent food boost, whereas others boost your creature’s speed. There are several pets that provide cool bonuses, such as percentage increase in total score, XP and coins. There are also attacking and defensive pets that spit fireballs, attract prey, reduce poison and arrow damage and shield your creature from those spiky mines. You can find eggs while playing Hungry Dragon. Make sure you upgrade your map to get their exact locations. Once you find an egg, you will have to incubate it and so will have to wait for some time to obtain a pet from it. However, you can break purple eggs immediately using gems. There’s a high chance of getting a common pet from an egg. Chances of getting a rare or epic pet are lower. However, you can get special pets when you open golden eggs. To get one, you will have to obtain golden egg fragments. A duplicate pet obtained from an egg converts into a fragment. Collect 50 such fragments to get a golden egg. You can easily get point multipliers if you eat prey such as a flock of birds, sheep and humans on the ground. With a high point multiplier, the fire rush bar will also increase faster. You will receive lots of rewards from “Newcomer’s Hoard”, which is a pre-registration reward. When they appear on the screen, just tap the “collect” button to get them all. I received a rare rainbow rage pet, a purple egg, 1 improved egg, over 200 coins, 5 golden fragments and 15 gems.